SpellList is an in-game spell database browser with filtering and chat linking capabilities. For a list of commands, type "/SL help"
Note: Version numbering is in the format X.X.YYYYY, where X.X is the addon version and YYYYY is the game client build the current code is updated to. Mismatching build numbers may result in some newer spells not being detected as the code scans through an adjustable range of spell IDs. SpellList is coded with a live scanner and filtering algorithm that uses FPS limit code to throttle itself to an acceptable rate. This rate can be adjusted and now saves between sessions. Spells shown in the list can be selected to keep its description in the details pane. This allows you to mouseover another spell and compare descriptions for both spells. Spells can also be linked into chat by Shift-clicking it in the list. the top right corner of the SpellList window. Auto Filter Box - Any item or spell can be dropped into this area to start. Note only items with a use effect have a spell attached to it. If an item given doesn't have a spell attached, the filter will be set to the item's name. Filter Text Box - Spell ID or Name may be given. To look for a specific rank of a spell, you must supply the name in the format, "Spell Name(Rank #)". This is the same format accepted by the /cast command. If an empty rank "()" is provided, the filter will search for spells matching the name given, if any, with no rank. Command Line - The command line system is able to set the filter using the same rules as the Filter Text Box by using "/SL filter". This method also allows the use of spell and item links, using the same rules for the respective spell or item as the Auto Filter Box. Using the command line input for the filter will automaticly show the SpellList window. Note linking an item that you do not have may not detect the spell on it. This is a limitation on the game client and not anything I have any control over. If the filter is supplied with an empty string or the Auto Filter Box is clicked without the cursor holding something, the filter will reset and display all spells found in the database. Alternatively, you may type "/SL reset" to clear the filter. -"scanstop" halts scanning for new spells, this is the only way to stop "scannew"
This would only happen theoretically if you tried using the "scannew" command. If that's the case, it would be doing as it was designed to do and wait for the "scanstop" command to halt it. I'll take a look into implementing an upper limit to this scan. Usually if there are new spells to be discovered, it should only take a couple seconds to get through all of them, but you still need to stop it when you think it's gone long enough without detecting a new spell, hence the "Last Spell" display under the title bar of the list frame. What this addon does is scan a range of SpellIDs and sees what data is returned by GetSpellInfo(). 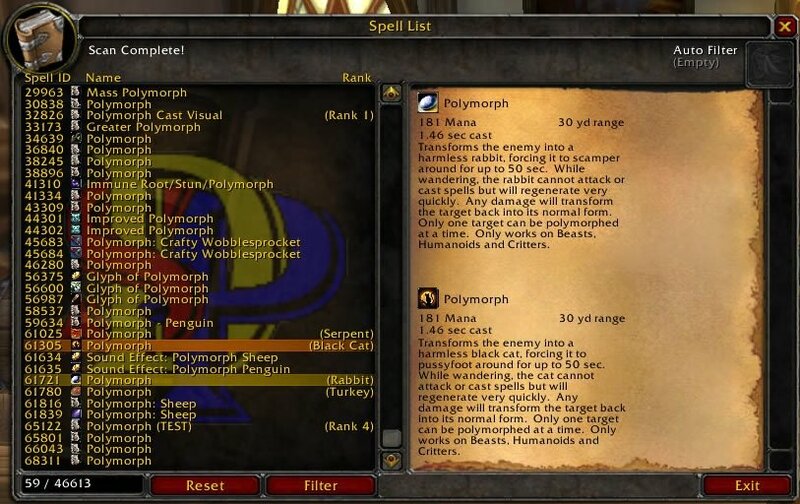 Out of what an addon can discover on its own (without use of a database), it can only identify what spells are available to your current class. For example, if you're playing a Rogue, it won't be able to tell what spells it has found are usable by a Warlock. A scan through your spell book would let it know what spells your Rogue can use, but that would be irrelevant in most cases. Last edited by SDPhantom : 12-01-12 at 11:00 AM. I had an issue where when I tried doing an update, it never stopped. Is that as designed? I let it go and forgot about it, and in the background it eventually got into a holy sh*t type number count..
As for the filter class/level, since you're pulling the data couldn't you (and this is ignorance of how it all works here) save it at the same time? Something like Linkepedia (item addon) does? Just thinking aloud. Not sure your coding expertise, but it's higher than mine. This feature will probably have to be its own addon. The data required will have to be provided in an internal database and actively maintained. This is because no API calls are available that supply the needed info to identify what spells are used by what race/class/spec/etc. Feature request - filter by class and/or level. Version 1.4 is out, which fixes problems with the scanner causing a momentary pause on load and freezing the game with the "scannew" command. So it's a list of all spells in-game, à la Wowhead? Does the addon work with all class spells, or just the one you're playing? It doesn't matter what class you're playing. The scanner doesn't care what's in your spellbook. It scans through a range of spell IDs and asks the game client what spell is associated with each ID. If the client responds with a spell, the addon stores it in its list. Most of these spells are abandoned spell prototypes, quest triggers, and crafting recipes along with item, mob, class, and talent effects. So, it looks like my manyaly filtering SBF going to be much more comfortable? thx a lot.